The GH5 is for video and photos so it’s a hybrid camera. Half use it for photos and the other half for video. They almost doubled their initial estimated sales. The GH5S and G9 were designed for those that needed more Photo or Video performance. The video performance is clearly different between the GH5 and GH5S. Panasonic listened to GH5 videographers creating the GH5S and could update the GH5 with some of the features later. 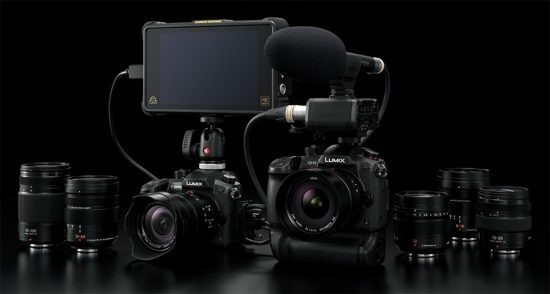 The EVA1, GH5 and GH5S were developed by Yosuke Yamane-san’s division at the same time. EVA1 is for broadcast use. Yosuke Yamane-san wanted to release the GH5S before the GH5. Panasonic thinks stabilized lenses are enough when used handheld and those that need more will use a gimbal. Panasonic is on track to do 8k for the Olympics. → The Panasonic GH5s will start shipping on February 6th (pre-order: B&H | Adorama | Amazon). This entry was posted in Panasonic and tagged CES 2018, interview, Panasonic GH5s, Panasonic Lumix G9 camera. Bookmark the permalink. Trackbacks are closed, but you can post a comment.